This 5 star tour highlights Oahu’s top spots in one adventurous day. Start your day with a trip to Pearl Harbor to visit the USS Arizona Memorial and Pearl Harbor Visitor Center. Then, continue the day with a tour around the island to view and stop at all our most scenic and world renown iconic spots. A perfect tour for those who want to experience the most famous sights in a day. Expect those little surprises that make a great tour into an Experience of a Life-Time. Experience the tragic attacks that took place on December 7, 1941. Pearl Harbor has truly become a must see historic monument for all guests to Hawaii. Let our professional Hoku Hawaii Tour navigators share with you their knowledge and education. From beautiful historical displays, museums of the Visitor's Center to the Memorial built above the remains of the USS Arizona, the feelings and emotions of the events are just as touching today as they were the day of the tragic attacks. Included is the award winning audio tour that will guide you through the Pearl Harbor Survivor segments while on board the USS Arizona Memorial. The USS Arizona Memorial Narrated Tour is available in English, German, French, Spanish, Japanese, Mandarin and Korean. This incredible self-guided tour will automatically translate the main 23 minute documentary into the visitor’s language. Witness the exuberant scenery Oahu has to offer on your journey from Pearl Harbor to the North Shore. Experience the ever changing landscape that transports you into the rural island life. Not short of stops, your navigator will guide you to the most beautiful places. Visit the world famous Dole Pineapple Plantation to ride the “Pineapple Express” train, and Tropical Macadamia Nut Farm, offering an abundance of Hawaii’s delightful treats and gifts! See the most famous big wave surf beaches in the entire world, including Waimea Bay and the Banzai Pipeline, where yearly surf competitions and giant waves, add to the legend and lure of Oahu's North Shore. You will also enjoy an exclusive canoe ride around the Polynesian Cultural Center (Closed on Sundays) and a delicious lunch and hulu experience. Luxurious stretches from the Pali Lookout to the rocky South Shore of the island are scenic lookouts and endless culture, found only in Hawaii. Along the South Shore are enchanting coastal formations, such as the offshore Rabbit Island and the Halona Blowhole, immaculate beaches like Sandy Beach, and the multi-million dollar mansions found throughout the Kahala Estates. This convenient and captivating Pearl Harbor and 5 Star Circle Island Tour is one of our most engaging and comprehensive tours. Experience diversity and the robust culture of the island's many sites, beaches, and stops during this full-day journey. 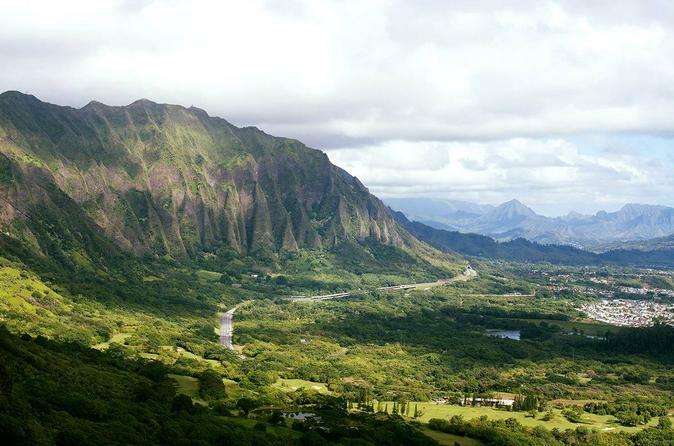 Uncover the most scenic side of Oahu and explore the ecology and natural landscapes of beautiful Hawaii with us today!